Juventus may be the current leaders in the Serie A with 70 points and a clear difference of 21 points over 4th placed Fiorentina, but when it boiled down to a semi-final Coppa Italia clash between the two, the Turin side are potentially faced with their first shock of the 2014-15 season. Two goals from Mohamed Salah (on loan from Chelsea) put the Italian giants behind by a goal in a 1-2 defeat in their own backyard, the Juventus Stadium. But the return of legendary center-back Andrea Barzagli should lend strength to the defense that was severely tested by the likes of Salah and Mario Gomez and could come under pressure again in Florence this weekend. Juventus could have have found their Mojo back having won all their five encounters since the early March loss to Fiorentina, which included an emphatic Champions League away win of 3-0 against Borussia Dortmund. Their defense, too, seems to be in fine fettle not having conceded a single goal in any of these five outings. But Fiorentina seem to be answering Juventus match for match. Apart from a slight hiccup in the form of a 1-1 draw against minions Udinese, they have managed some high-profile wins in the past one month that include a 2-0 win over 5th placed Sampdoria, a 3-0 clobbering of 2nd placed AS Roma and a 2-1 win over AC Milan. Juventus strikers Tevez, Morata and Vidal will have their job cut out at the Sartemio Franchi stadium, for they will have the onerous task of scoring at least two goals and prevent the Florentine club from scoring even once. The Turin club has the firepower to score what with Tevez, Morata and Pogba getting a combined tally of 45 goals this season. But they will have to contend with one Mohamed Salah. The prolific 22-year old Egyptian striker has found the net 6 times in his last 8 appearances for his club and backed by some hysteric home-crowd support, it's likely that he could score again for Fiorentina on Tuesday night. Winners of umpteen number of Serie A titles, Juventus, haven't won a single Coppa Italia title since 1995. The best they did after that was when they emerged runners-up in 2012. 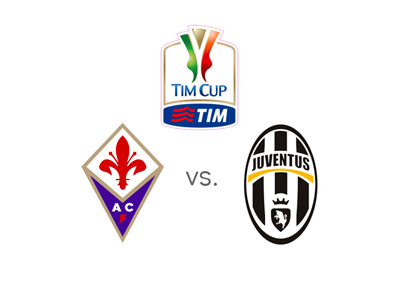 For Fiorentina it will be their first shot at the title since 2001 when they last won it. The Florentians definitely are on a comeback trail and will be desperate not to let an opportunity like this one pass. A Juventus on the ropes down 1-2 and the return match at home at the Sartemio Franchi - a scenario fit for Fiorentina to deliver a knock-out punch. But it's the awesome reputation as the Numero uno club of Italy and the immense firepower that Juventus possess in them to make a comeback that have influenced bookmakers to place odds in favor of the Turin giant to win on Tuesday night. Fiorentina are still the favourites to advance to the tournament final. This indeed has all the makings of a highly charged encounter.